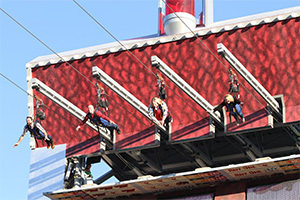 Standing as an iconic installation in Downtown Las Vegas, NV, the SlotZilla offers zip lines in an urban setting. Flanked by two figures of beautiful showgirls, this massive slot machine comes with cool decorations that are inspired by local casinos and resorts. As you zip through the busy Fremont Street Experience, you'll be cheered by large crowds under your feet. Click to book your Big Bus Tours. There are two thrilling zip lines that are available at the signature SlotZilla. If you choose to get a pass for the conventional Zipline, you'll start the adventure from a platform that stands 77 feet above the historic Fremont Street. After taking off, you'll enjoy a thrilling ride in an upright sedentary position. Click to book your Big Bus Tours. The trip ends inside the Fremont Street Experience, which is an indoor retail complex. Under normal conditions, the Zipline lasts up to 30 seconds. More specifically, you'll stop near the Fremont Casino and Four Queens Casino inside this shopping hub. If you want to feel a more adrenaline-stimulating experience, then try the Zoomline. You'll take off from a platform that's situated more than 110 feet above the streets. Instead of assuming a sedentary position, you'll fly like a superhero on this zip line that offers a maximum acceleration of 40 MPH. The Zoomline course ends at the Golden Gate Casino, which marks the western end of the Fremont Street Experience. It takes about a minute to complete this awesome zip line ride. You're more than welcome to dress up in a costume of your favourite character from comics, movies and animated films. It's quite common for people to ride the Zoomline in costumes of Superman, Power Rangers, Wonder Woman and Captain America. You shouldn't have a problem finding such cool attire in the unique shops of Downtown Las Vegas. After buying your ticket to the SlotZilla, you should arrive approximately half an hour before your schedule boarding time. Upon entering the designated facility with a valid pass, you will have to be officially weighed. Additionally, the staff members will conduct the appropriate safety inspections of your harness and other hardware. Unfortunately, you will not be allowed to bring a smartphone or other video-recording device to the zip line. However, you can rent an approved helmet that's equipped with a GoPro camera. The videos and photos of your ride could be purchased upon checkout. Lockers aren't available at this attraction, but you will get a backpack or bag to store personal items. Therefore, you won't have to return to the iconic slot machine just to retrieve belongings. Most guests must walk several flights of stairs to reach the platforms for the zip lines. Elevators are available for disabled people or upon special request. The Zipline and Zoomline rides operate on a conventional gravity mechanism, so you'll always be heading downwards after takeoff. Therefore, these are relatively quick one-way rides that don't come with any complimentary return service. 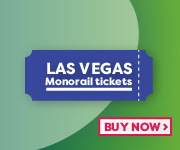 The SlotZilla is located on the historic Fremont Street in the heart of Downtown Las Vegas. If you visit by car, you could park in the indoor garage that stands at the corner of East Cascade Avenue and 4th Street. Getting to this part of the city should be easy by buses that are managed by the Regional Transportation Commission of Southern Nevada. In fact, the 215 and DEUCE lines conveniently stop near this gigantic slot machine. The RTC operates several routes that connect the Las Vegas Strip with the downtown district. Click here to visit SlotZilla official website.